If cremation is a part of your final plans or wish of the loved one you lost, you’ll take deep comfort in knowing that every step of the cremation process is handled with dignity and care at DeBord Snyder Funeral Home & Crematory. Your loved one will always be in our care at our very own on-site crematory, established in 1992, where certified, trained professionals handle every detail with compassion and diligence. Our family’s level of experience with cremations is unmatched by any other funeral home in Lancaster County. We would further like to assure you that cremation does not limit your options for a personalized service. Your family will be able to participate in the whole process by working with our experienced staff to plan a meaningful tribute that can include a viewing or visitation. You’ll also be guided through a variety of memorialization options to choose a final resting place that is most suited to your loved one’s wishes and needs. At DeBord Snyder Funeral Home & Crematory, we help families understand the cremation process and do everything in our power for the cremation to proceed smoothly – reducing stress at a time when family members may be burdened with grief. During the process of cremation, we will respectfully take every measure to protect and maintain the dignity of the loved one lost. Once given permission, we will immediately arrange to transfer your deceased loved one from the place of death directly into our care at our funeral home. There will be absolutely no stops in between (e.g. to transfer another decedent) and your loved one remains under our professional care and supervision. If death occurs at a care facility (retirement community, nursing home, etc.) we will require the staff at the facility to document all personal items (if any), which will be accompanying the deceased (e.g. jewelry, pictures, stuffed animals, etc.) to our funeral home. When your loved one first arrives at our funeral home we use a double check entry system. We document the deceased’s arrival with a personalized name card, which will be kept with him or her, as well as all personal effects verified through the personal effects form signed by the care facility (retirement community, nursing home, etc.). This ensures proper identification and guarantees all of the decedent’s personal items are accounted for. The family of the deceased then has the opportunity to decide if these personal items will remain with their loved one during the cremation process or returned to them. We don’t want you to ever worry that the cremation may take place before you have had your chance to say your final goodbyes. You will be given an opportunity to see your loved one at our funeral home prior to the cremation. Our staff will prepare and dress the deceased in the clothes provided by the family or cover him or her with a sheet and quilt. The facial features will be set (eyes and mouth closed) and your loved one will be placed on a rollaway bed with a pillow in our chapel. Prior to the cremation taking place, one of our certified crematory operators along with another member of the funeral home staff will verify the match between the paperwork, name card, and permits to ensure utmost accuracy. The decedent’s identification card will then be secured to the outside of the cremation chamber door during the cremation process. Our on-site crematory is operated by certified crematory operators. Our operators are certified by the Cremation Association of North America, a mark of distinction that ensures the most current crematory operating standards and proves our commitment to safe cremation practices with the highest respect and caring for your loved one. Another testimony to our compassion and consideration is our commitment to performing cremation to only one decedent at a time. Once the cremation is complete and the cremated remains have been properly processed at our crematory, we will secure them in our funeral home in preparation for the memorial service or place of disposition (e.g. cemetery or church columbarium), according to your family’s wishes. DeBord Snyder Funeral Home & Crematory provides the same level of attention and care to the families who bury their loved ones as well as families who choose cremation, assisting with all suitable methods of further disposition. This includes burial of ashes in a family lot, entombment in a columbarium, division and distribution of ashes, scattering of ashes, burial at sea, and other methods of disposition and memorialization. 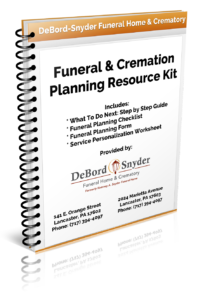 DeBord Snyder Funeral Home & Crematory, a trusted provider of affordable cremations serving Lancaster County PA, will help you and your family with your cremation planning and explain all your options.